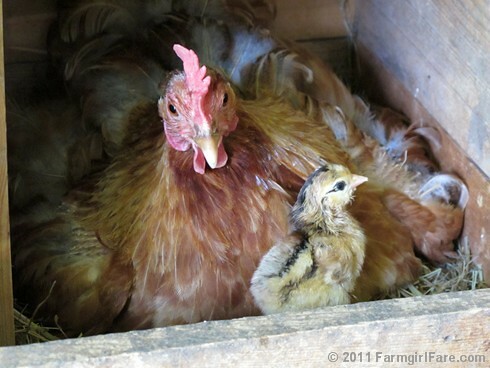 Farmgirl Fare: Sunday Surprise Dose of Cute: Peep! Okay, I know this sounds silly, and maybe you've talked about it previously, but - how do you know when an egg is to be collected for breakfast or when it should be left alone to become another peeper? I understand the rooster's role, but aren't there roosters on most egg farms - or not? Baby chicks are sooo cute! Whoo hoo! Way to go, Whitey! I wondered how the old girl was doing! Congrats on your newest peeper! What do you DO with all these chickens? I mean, I guess the ones that end up being roosters probably go into the freezer, but all the hens? And all those eggs they lay? I'm daunted at the thought of having six hens and using four dozen eggs a week (though this is easier for us than for most people, egg eaters that we are), but you must have vast multitudes of eggs. What do you do with them? Ooohh, how lovely. Our kids would love to have some little peepers. We have hens but no cockerel but have thought about buying fertilized eggs and bringing them on. May just have to after seeing this. Hi Susan! First of all a huge Congratulations to you for six years of sharing your farm life with the rest of us!! That is amazing and extremely generous of you!! I personally can't think of one thing to tell you that I would want you to do different - I love everything you post - all the animals, recipes, Hunky Farm Guy (well, we would all love to see a really good close-up, no hat kind of picture, but we do respect your privacy so that may be asking for a bit too much... :) planting, your kitchen garden, the wash line, the treasures you find, don't forget all of the 'rock hearts' - love it all!!! Seriously, I think we all have learned so much about farm life from you and have also come to appreciate that it takes a lot of very hard work to accomplish everything you do - every day! A million thanks for sharing - it is so appreciated. The new little 'peeper' is a cutie! So...what do you do with all of those eggs? What a sight to see. Momma and baby chick. You are so lucky to live on a farm and see all of the miracles of life. I know it's lots of work, but I would enjoy it. Thanks for sharing such a cute pic. We love chicks. What a sweet little peeper. We are so excited to get our Buff Orphingtons. I have heard they are good setters. We will have chicks! Chickens can live so long and have such lives full of chicken-ness goodness! Factory farming is such a shame - where chickens are killed so young. I was wondering about Whitey... Good to know that she's still around!